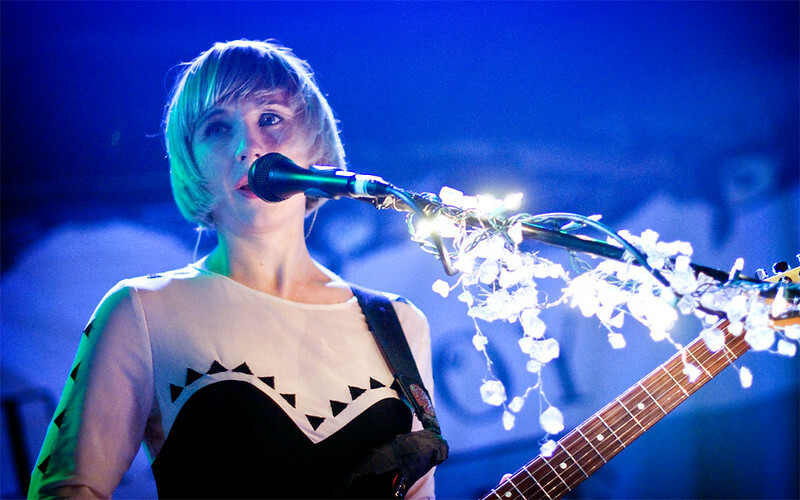 After countless of tour dates stretching across the United States and Europe, The Joy Formidable have finally found time for relaxation. They've recorded a new song in their native Welsh tongue called "Yn Rhydiau'r Afon" which translates into In the "Fords of the River" and, based on the research I've been able to come up with (ie: google), it's a Welsh idiom meaning "on your death bed' or something of that nature. That sort of explains the official music video showing the point-of-view of a camera peacefully floating downstream. Later at some point, the camera reaches rough waters and tips over, under water as Ritzy, Rihydian and Justin look helplessly on. It's a tranquil melodic tune that swells towards the end with a soaring chorus. The single is part of a new series of 7" vinyls where the group shares a double A side with another Welsh artists that they admire. This first offering is called Aruthrol A with the single "Yn Rhydiau'r Afon" along with a song from Colorama. It's on sale now and it's limited to only 500 copies so get 'em while you can. Check out the video below. You can grab the vinyl right HERE.